The Ebac 2650e Dehumidifier is manufactured by one of the leading UK based dehumidifier manufacturer. The Ebac 2650e is one of two machines in the Ebac 2000 series and is designed to control humidity in homes with a total floor area of up to 180 m2. The other machine in the series is the Ebac 2850e dehumidifier which is identical to the 2650e in every respect except capacity. The Ebac 2850e dehumidifier offers a greater water extraction rate of 21 litres per day (at32C / 90% RH) and is rated as suitable for a home with up to five bedrooms and with a floor area not greater than 210m2. All other details are the same and all comments apply equally to both machines. Ebac take pride in the quality of their machines and the patented technology engineered into them. At the core is "SMART Control™", a patented and trade-marked technology which records humidity levels through the day and "remembers" which parts of the day are the most humid in your home. Using this information the dehumidifier is automatically switched on and off according to need, saving you money. The Ebac 2650e dehumidifier is equipped with "intelligent defrost". This dehumidifier, like most domestic dehumidifiers, uses a refrigerant process to remove excess humidity. It has refrigeration coils on which water from the air condenses. When the air temperature is too low, below 15C, water starts to freeze on the coils and stops the machine. "Intelligent defrost" predicts when this is about to happen and suspends the refrigeration process, allowing the coils to defrost. The speed and efficiency of this process is greater than alternative methods, saving yet more energy cost. The refrigeration coils have a "hydrophilic" coating which speeds the flow of condensed water from the coils. This feature means that water can be extracted and collected more quickly, another means of saving energy. Taken together, "SMART Control™", "intelligent defrost" and "hydrophilic" coils" make the Ebac 2650e dehumidifier more energy efficient than many others on the market. The Ebac 2650e dehumidifier is capable of a maximum water extraction rate of 18 litres per day. Please do not expect that rate to be achieved in the conditions normally found in your home. In the table below you will see that the figure of 18 litres was recorded at a temperature of 32C and a relative humidity of 90%. Extraction rates fall dramatically in cooler, less humid conditions. All dehumidifier suppliers quote the figure this way. What it tells you is that one dehumidifier will extract more water in a given time than another. Quoting the rate under "standard" conditions, however unrealistic, makes it possible to compare two different dehumidifiers on a level playing field. In selecting a dehumidifier the question of capacity is always tricky to advise on. As a general rule we suggest that in cases where the area you wish to dehumidfy is very close to the maximum stated in the specification of any dehumidifier it is wiser to err on the side of caution and buy "one size bigger". This is clearly preferable to finding the need to buy a second machine. In addition the Ebac 2650e dehumidifier is also equipped with a "boost control" providing eight hours of higher water extraction. This is particularly helpful when drying laundry inside the house. It also has a built in "cable tidy" for convenience when not in use. The machine comes with a free five year warranty but this only applies if the machine is bought directly from Ebac. 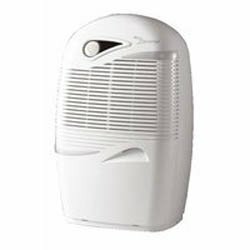 The Ebac 2650e dehumidifier can be bought from a number of third party retailers, usually at lower prices, but different, usually inferior, warranty arrangements apply and any necessary repairs will have to be arranged directly with the supplier, not the company. Ebac has a 30 day return policy but, once again, refunds and replacements are only dealt with by Ebac if you buy direct from the company. In effect these provisions mean that the difference in price between Ebac and third party suppliers is the cost of the warranty. Having said that a five year warranty is a major advantage, at a relatively modest additional cost, which you may consider worthwhile. When buying from third part suppliers it is only sensible to compare prices inclusive of that supplier's additional charges for a five year warranty and judge value for money accordingly. The Ebac 2650e is a well built machine. It is made in the UK which should make repairs, if required, quicker and easier than with a machine made overseas. The innovative technologies used in the design make the machine energy efficient which reduces whole life-time costs. The machine is versatile. It is entirely suitable for use in the home but its relatively low minimum operating temperature of 3C means it should be equally suitable for colder areas, such as a garage or cellar, should the need arise. The purchase cost of this dehumidifier is relatively high, especially if bought direct from Ebac. If you want a cheaper dehumidifier there are plenty on the market. The issue is one for your own personal judgement. With dehumidifiers the old saying "you get what you pay for" is as true as for any other product. What you pay for here is the quality, lower running costs, the versatility and, if you buy direct from Ebac, a superior warranty. Some owners have complained about the level of noise made by the machine when in operation. There are definitely dehumidifiers with a lower recorded noise output. The issue of noise is subjective and few people have lived with more than one or two different dehumidifiers so comparisons are not easy to make. Build quality may be important here because noise tests are taken with new machines, taking no account of how extended use may lead to increased noise as parts deteriorate. Choice of settings, including the automatic "Smart Control™"